Tim's Pick: Always something extra in the gym when a #1 takes the floor for the first time. Hilldale beat Loudonville by 25 in the first game of the season, and I don't see this one being much different. Hillsdale 65 - Loudonville 41. Tim's Pick: The PAC vs. the OCC. Tuslaw is much better than Chippewa, but it won't be enough to beat Orrville. Riders seem to have a little chip on their shoulder, and that's a good thing for Rider fans. Orrville 61 - Tuslaw 49.
close; but the Riders are just too athletic, in my opinion. I do not think the game will be as close as the score. Tim's Pick: The first potential meaningful upset of the tourney. Triway beat Northwestern way back in game #1 of the season, and Northwestern has won six games by 5 points or less this season....so I don't see them running away with the game. Still going to pick Northwestern, but this one has potential, especially if Triway grabs a lead and can take the air out of the ball. Northwestern 58 - Triway 53. Andrew's Pick: Wellington’s #45 Perry was a key player in the paint in their first round game, but Smithville did not have much size on the court to slow him down since Klotzle was out with foul trouble most the night. In the most important matchup of the tournament, Andrew and I have devised a little points system to crown the annual Wooster District Know-it-All champion. We agreed on a system awarding 1 point for a correct pick, 2 points for predicting the right winning margin, and three points for predicting the exact score. Through round one, the defending champ (me) ain't doing so good. Andrew picked 5 of 6 games right, but didn't hit any margin or exact score picks, so he has 5 points. I picked a miserable 3 of 6 games correct, again no extra for accuracy, so I've got 3 points. 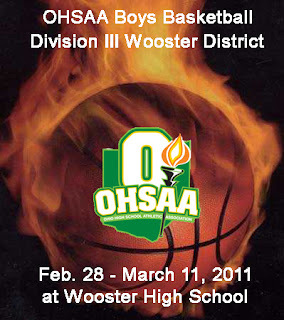 Check back for the district previews/predictions early next week.